A proposed strike by baggage handlers at Belfast City Airport has been suspended, their employer Swissport International has said. Unite union members had planned to walk out at 14:15 BST for two hours over Swissport's dismissal of a union representative. Swissport said it held "extensive talks" with Unite union representatives on Monday morning. It added that further discussions with the union were "pending". Unite's regional industrial officer George Brash said: "Today, for the first time, real progress has been made and it is clear that management now recognise the determination of their workforce to defend their trade union and their workplace representative who was dismissed by management last month. "Swissport management has committed to review their human resources processes in relation to the case and have accepted to conduct an audit of industrial relations at the site with the independent Labour Relations Agency. 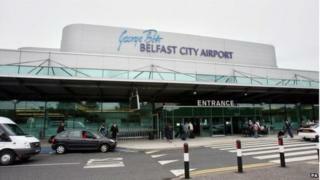 "In order to avoid any unnecessary disruption to services at Belfast City Airport and to the travelling public, Unite has agreed to suspend our planned action for two weeks pending the results of those review processes," he added. Nine flights would have been impacted by the strike action had it gone ahead.